Michael Ricci (born October 27, 1971) is a Canadian former professional ice hockey centre who played 16 seasons in the NHL. Mike Ricci was selected 4th overall by the Philadelphia Flyers in the 1990 NHL Entry Draft. He had come off of three stellar seasons with the Peterborough Petes, and was dubbed a cannot-miss prospect. 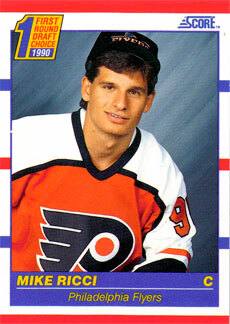 Ricci lasted only two years in Philadelphia, as in the summer of 1992 he was traded to the Quebec Nordiques in the Eric Lindros blockbuster trade. Ricci would have a career year in his first season with the Nordiques, scoring 78 points. 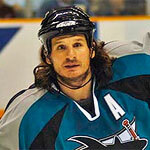 Mike Ricci quickly became an elite defensive centreman with San Jose, but he never was able to regain the offensive prowess of his earlier years. In 2005, Mike Ricci switched his uniform number to 40 in honor of formerNFL player Pat Tillman, who was killed in action while serving for the U.S. Army. The two had met in San Jose. On August 13, 2007, Ricci announced his retirement after telling The Peterborough Examiner that he had not recovered from neck surgery as well as he had hoped.